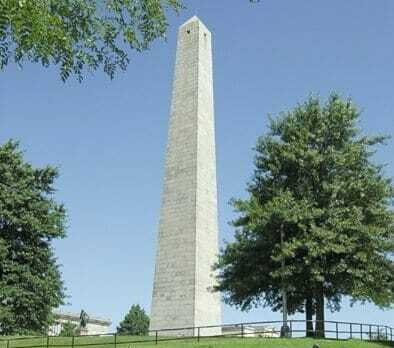 Sitting atop Breed's Hill is the 221 foot granite obelisk erected to commemorate the fallen in the first major battle between the patriots and the British during the Revolutionary War on June 17, 1775. Though it was named the Battle of Bunker Hill, most of the fighting occurred on Breed's Hill. While the British technically won the Battle of Bunker Hill, the colonists surprised the redcoats with taking almost half of their army as casualties. This showed the British that the soon-to-be-made Americans were serious about proclaiming their liberty. On this site there was an original monument, an 18 foot tall wooden pillar topped with an urn, created in 1794 by King Solomon's Lodge of Masons to memorialize a fellow Freemason, Major-General Dr. Joseph Warren. The existing pillar was finished in 1842 and completely renovated in 2007 with handicap accessible improvements and repairs. At the base of the monument lies the Bunker Hill Lodge, also made of the same granite as the obelisk and built to commemorate Dr. Warren. Across the street there is also a Bunker Hill Museum. The Freedom Trail passes through the Monument and those taking part in the tours will learn more about the obelisk and the battle it memorializes from informative guides. The National Park Service does not offer any guided tours although park rangers are available to answer questions. If your group is interested in exploring the history of Boston, don’t miss out on the Bunker Hill Monument. Feel free to sit on the lawn and admire the granite obelisk, wander down to the Lodge or museum, or climb to the top of the monument and see a bird’s eye view of Charlestown. Though it is handicap accessible, be aware that there are 294 steps to the top of the monument and it is quite a trek.